Relating to a symbol or a notation of quantity: Mr. Alfred is teaching his students about the various numeric systems that exist in Arabic and Roman formats; such as, 1, 2, 3, 4; or I, II, III, IV, etc. Melvin was using the numeric keyboard on his computer to compile his tax report. 1. Of, relating to, or of the nature of an amount or amounts: The files were organized according to a numerical system. 2. A figure, sign, etc. ; that indicates a quantum: The real estate is presented in numerical order based on the values of the houses. 3. Designated by a number instead of a name: Instead of listing the names of customers, the store organized them by using numerical codes. An arithmetic method of classifying large numbers of bacterial organisms on the basis of their overall similarity to one another, according to the number of phenotypic (biochemical) characteristics that they have in common: The microbiologists, Linda and Jeff, used numerical taxonomy to help them identify and to categorize the various bacterial strains that they were examining. A reference to quantities or rations: The numerically designated words, that were expected to be completed for the dictionary by the end of the day, could not be achieved. 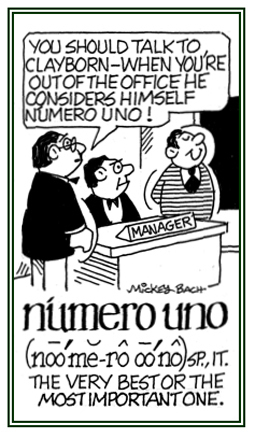 Another term for "number": Trying to show off, Mike asked Mary for her telephone numero. 1. An informal or slang term for a position that is superior when compared to another person or something else: As a computer programmer, Josh is considered to be the numero uno or the most outstanding technician among all of the website specialists in his company. 2. A person's self-interest which is always number one: Sam always takes care of numero uno before he considers the desires or needs of anyone else. © ALL rights are reserved. A reference to the science of quanta (quantities) or words that represent symbols: Bernhard, the financial accountant, used a system of numerological reports. 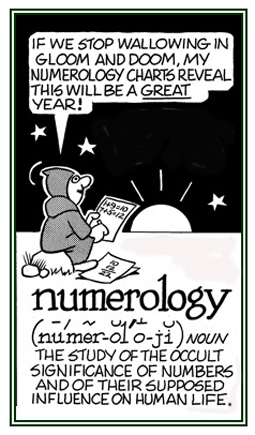 A believer or someone who practices the art of predicting the future based on mathematical quantities that are related to a person's birthday: Gerald, the numerologist, told Maurice that his book would be a successful publication and financially rewarding for him. 1. The study of digits, as the figures designating the year of a person's birth, to determine their supposed influence on his or her life, future, etc. : Shane's interest in numerology came about because he was influenced by his aunt who convinced him that she could predict his future. 2. The study of the occult meanings of numbers and their supposed influence on human life: Numerology is the study of the mystical or esoteric relationships between digital notations and the character or action of physical objects and living things. The numerologies of divination were popular among early mathematicians; such as, Pythagoras, but they are no longer considered to be part of mathematics and so they are now regarded as a pseudoscience by most mathematicians. The beliefs in numerology are similar to the historical development of astronomy which is separated from astrology; as well as, that of chemistry from alchemy. The name or names of a series of symbols of a fixed order which can be determined by calculating: Whenever Sarah tallies her mathematical solutions, she uses numeronyms; such as, "one" for 1, "two" for 2; "three" for 3; etc. A phone number where the numbers also spell out a word or phrase: Some companies use numeronymous systems in order to make it easier for users to remember what the phone number is; such as, 1-800-GO-OFFICE instead of 1-800-07-5647878. A fear of a specific digits, or of digital notations in general, which can cause considerable distress when having to use them: There are still many people who have a particular numerophobia regarding the number 13. For example, some apartment buildings do not have the 13th level, but proceed from the 12th to the 14th story! 1. A rhythm, harmony, or flow in multiplicity (a lot of something, usually countable and varied): There were numerosities of vocal and instrumental presentations at the musical competition. 2. That which is large in plentitude or a large abundance of something: The numerosity of people at the demonstration got the attention of government officials and the news media. 1. Pertaining to very many; being or existing in great profusion: Trudy made numerous visits to see her mother at the hospital. 2. Resembling or comprising large multitudes of units or individuals: Recently there have been more numerous visitors to the park. A reference to large bunches or capacities: The students, including Ronald, are more numerously participating in the scientific studies than was anticipated by the school administrator. Showing page 4 out of 5 pages of 73 main-word entries or main-word-entry groups.